The idea of merging times from two different meets demands a bit of explanation. How can you take results from two completely different meets and throw them into a meaningful set of combined results? I thought about this question for a long time this weekend and eventually came to what, to me, seemed like a reasonable solution. You begin with taking a third meet which had a very large representation from both Liberty Bell and St. Vrain as a point of comparison. In this case, I took the Arapahoe Warrior Invitational. 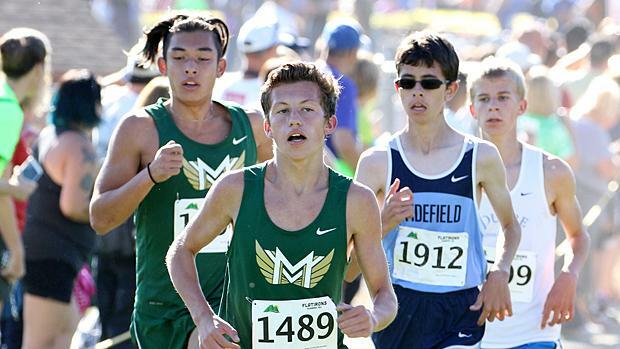 Of all the boys who ran both Arapahoe and Liberty Bell, you had an average time of 20:42.5 for Arapahoe and an average time of 19:32.9 for Liberty Bell. That means you could multiply the boys times from Arapahoe by .944 and "get" the times for Liberty Bell. The girls numbers were 25:11.6 and 23:41.5, yielding a multiplier of .940. Averaging the two multipliers leaves us with a .942 multiplier to "get to" Liberty Bell from Arapahoe. You apply the same treatment to Arapahoe and St. Vrain. The numbers for the boys who ran both meets were 21:03.0 and 20:29.2, giving a multiplier of .973. The numbers for the girls running both meets were 25:25.7 and 25:07.34, giving a multiplier of .988. Averaging the multipliers gives us .9805. Now, suddenly, we have a basis for comparing Liberty Bell and St. Vrain. Since .9805/.942 = 1.041, we can "equalize" Liberty Bell times to St. Vrain times by multiplying the Liberty Bell times by 1.041. Do that, throw all the times into a single basket, and score. Only there were too many times to throw in for any sort of manageability. Since Excel has problems with times over 24:00 to begin with, I first threw out any Liberty Bell and St. Vrain times at or over 24 minutes. I threw out teams that couldn't complete their scoring without runners over 24 minutes. I threw out out-of-state teams from Liberty Bell (except Albuquerque Academy since they are also a SW region team). Still too large of a meet, so I arbitrarily cut off the boys scoring at 20:07. My apologies to the teams that didn't make that cut. As you might have expected, there was still a massive number of ties in the scoring to break. Without an easy way to randomize at each tie point, I must confess some advantage in tie breaking went to St. Vrain teams and teams earlier in the alphabet. So, you might want to pay as much attention to the team times as the team scores, and especially so when the team scores are close. With all that as disclaimer, here's what you get when you merge a team score for the better teams from both Liberty Bell and St. Vrain from this past weekend. And, yes, Mountain Vista does look very, very good on this analysis, with Palmer Ridge edging Arapahoe for second. The girls merged scoring will come tonight and I think will be a bit more accurate of a merge. The 24-minute cut-off for the girls eliminates a lot more times and teams, making the whole team scoring exercise a lot more manageable, and with a lot fewer ties to break involved.